24 Basic Joseki (基本定石24 武宮 正樹 ISBN4-480-69122-7) by Takemiya Masaki (1992), 222 pages. Probably many readers of the joseki chapter in Kageyama's Lessons in the Fundamentals have wished there were a whole volume written along those lines. By a stroke of luck, Takemiya's book appears to fulfill that wish. After reviewing the case against wholesale memorization, Takemiya concludes that a sub-shodan player really needs only a small repertoire of truly indispensible joseki patterns, understood in depth. This should include not only the ability to punish misplays or premature tenukis and to avoid such sins, but also an understanding of joseki selection and post-joseki direction of play. This book is Takemiya's selection of such a repertoire, so presented. Within each joseki the variations are restricted to a small number that are frequently encountered, exchanging breadth of coverage for thorough explanation; but Takemiya is flexible on this point, presenting extra variations where he thinks the reader needs them. Only 4-4 point josekis and those stemming from the one-space high kakari against the 3-4 point are considered; but within this self-imposed limitation I think that the book delivers on its promise. Comparison with 38 Basic Joseki --a book with different aims-- is interesting. Only ten sections of that book are devoted to any material that also appears in the present book; but what does appear has been redistributed into twice as many separate sections with greatly expanded explanation. Some additional josekis are also discussed, including several important side invasions. 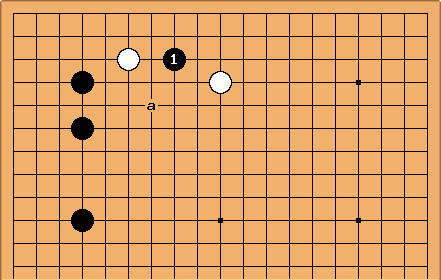 Takemiya usually begins a section with with one main-line sequence, introducing variations in the spirit of, "what if one side doesn't cooperate? ", or "which moves can be safely varied?" Refutations of some common mistakes or overplays get prominent emphasis, and sometimes even mistaken "refutations" are included (for criticism!) when Takemiya thinks they get played too often. 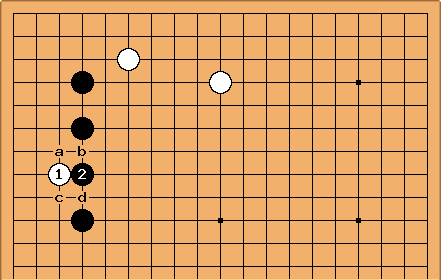 Next, he presents whole-board positions where the joseki might or might not be just right. When it isn't just right, sometimes all that's needed is a minor adaptation --flexibility-- while other times a completely different joseki is recommended. This is sometimes a lead-in for a later chapter. Each section concludes with more whole-board positions where "after-joseki" play is discussed. This seems to mean, what to do with sente if you have it (and be aware that you do have it!). The direction of play discussion in 38 Basic Joseki is much more condensed. Throughout the book, one hears Takemiya's personal voice. In the very first section, for instance, he says that the 4-4 attach-extend joseki is sometimes called a "handicap joseki"; but, he says, this is ridiculous! -- he plays it himself in even games. Now and again he says that he just cannot accept some widely recommended variation. Several times, after recommending a line of play in a sample position that arose in one of his own games, he gives his actual continuation from the game -- and it's different! He usually suggests that amateurs do not have to follow his tactically difficult example. But in at least one position he says that, to a professional eye, the admittedly good result obtained from typical amateur play isn't really good enough, and he leads the reader through the complications of a more enterprising line. By way of introduction to this section, Takemiya presents a whole-board position in which Ba gives a result "which should give the reader a refreshing feeling." Nevertheless the invasion at is even better. With the rest of the stones in place, this is the position alluded to in the last paragraph above. 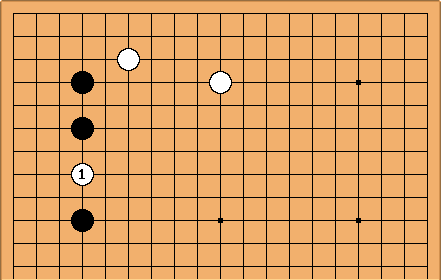 The continuation isn't that difficult, but since there are a number of options for white, black needs skill with sabaki, and attention to ladder issues. Takemiya says that this invasion occurs in both handicap and even games, but "everyone" (minasan) responds incorrectly; so even a glance at this section should immediately strengthen the reader's play! He spends a little time on typical poor responses before focusing on good ones. The sections of this book vary in length. While the very shortest is a mere 4 pages, this one is 20 pages long, the longest in the book. Takemiya says that not only does this invasion appear in amateur play, but he sees it all the time in professional games -- he both uses it frequently and expects it to be used against him. First, black must always respond at 2. Following that, the possible white responses at a, b, c or d must be investigated, which accounts for the section's length. The book is written with a nice flow and, unlike a reference manual, can readily be read from start to finish. As for intended level of readership, it appears in a set entitled Breakthrough to Shodan. I first got this book when I was AGA 9 kyu, far from breaking through, and I was delighted with it. At 3 kyu, I don't even yet play all the josekis covered in here (or rather, I muddle through them when I have no choice). I'm planning a big reread soon.